Do you sell both hot and cold beverages up to 32 ounces? If so, this vertical coffee cup and party cup dispenser is for you! There are nine sections total with 4” of space in six sections and 5” of space in three sections. 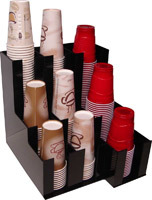 Cups can be stacked up to 30” high in the six 4” sections and up to 9” high in the three 5” sections. 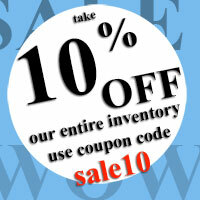 You can neatly store cups and lids sizes 8 ounces up to 32 ounces with ease. This dispenser will hold any size or type of cup (foam, plastic and paper) from any manufacturer. Total unit dimensions are: 12” tall by 13.5” wide by 15.75” deep.